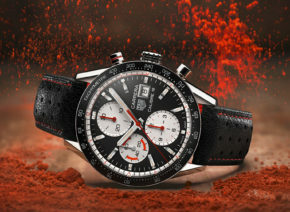 Since the presentation of TUDOR’s first chronograph in 1970, of the Prince Oysterdate, the brand has always produced watches that are closely tied to the world of motorsports. 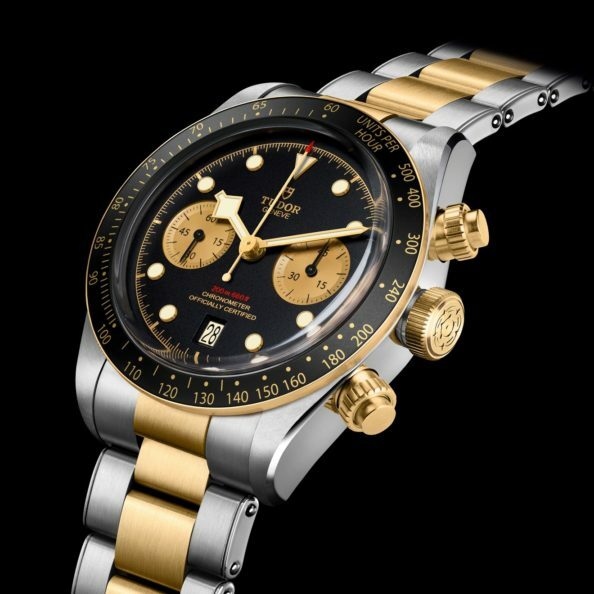 In the same way, since 1954 TUDOR has been constantly improving its professional divers’ watches. The daringly hybrid Black Bay Chrono S&G chronograph (S&G stands for Steel & Gold) combines this aquatic heritage, represented by the Black Bay family, with the queen of the racetrack, the chronograph, for a precious sporty-chic result with an undeniable touch of nostalgia. Remaining faithful to the Black Bay aesthetic, the Black Bay Chrono S&G model makes the famous “snowflake” hands – the signature of TUDOR divers’ watches since 1969 – its own in a gold version refined for optimum readability against the domed matt-black dial. Its counters are hollowed and their champagne colour creates optimum contrast. Following the TUDOR chronograph tradition, a date aperture is positioned at 6 o’clock. The main Black Bay characteristics are retained, in a slim 41-millimetre steel case and equipped with yellow-gold pushers inspired by the very first generation of TUDOR chronographs. A fixed bezel in yellow gold with a black anodised aluminium insert and tachymetric scale completes the face of this elegant, sporty chronograph. 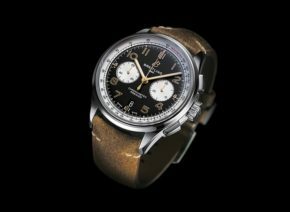 With a 70-hour power reserve, a silicon balance spring and Official Swiss Chronometer Testing Institute certification, the Manufacture chronograph Calibre MT5813 that drives the Black Bay Chrono S&G model is a high-performance movement. 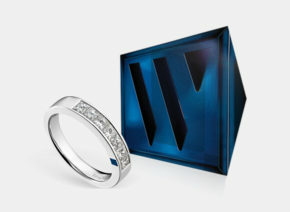 It was designed in the purest watchmaking tradition, with a column-wheel mechanism and vertical coupling. 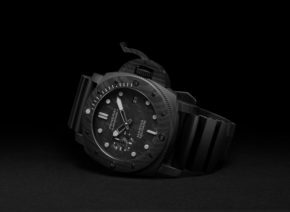 In keeping with the TUDOR philosophy of quality, it presents extraordinary robustness and reliability, guaranteed by an array of extreme tests applied to all TUDOR products. 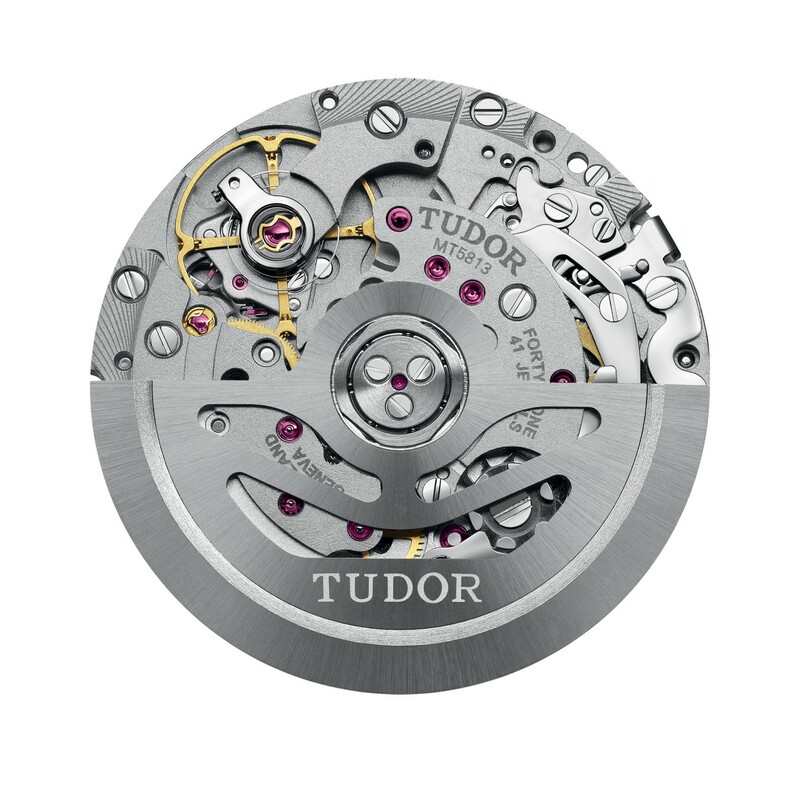 The fabric strap is one of the signatures of TUDOR, which remains one of the first watch brands to offer it. Woven on 19th-century Jacquard looms by a 150-year-old family firm from the region of St-Etienne, its manufacturing quality and comfort on the wrist are unique. 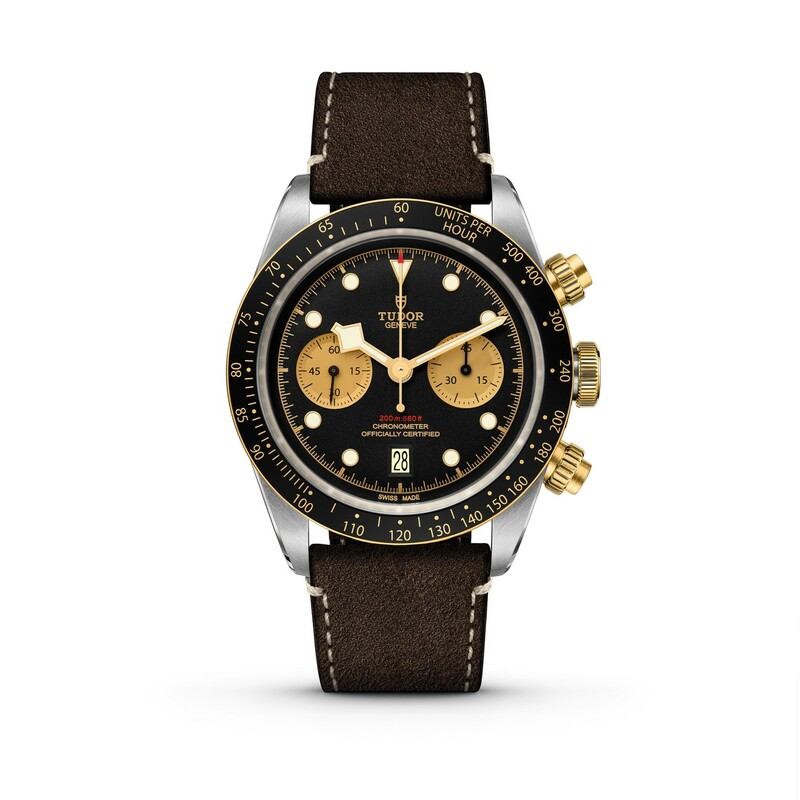 The Black Bay Chrono model presents a black strap, chosen by TUDOR and woven by the firm. 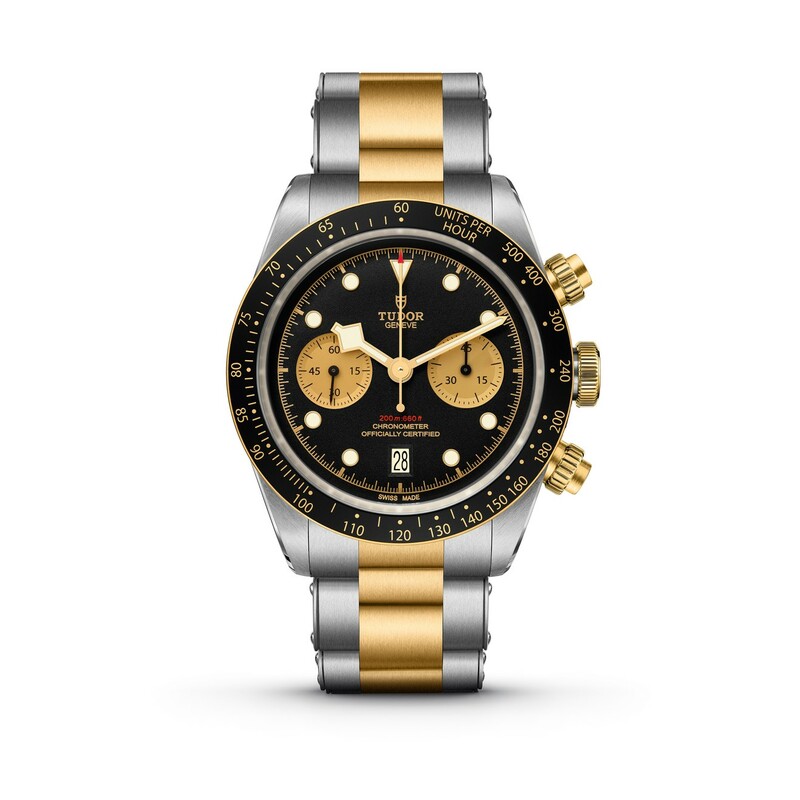 The model is also available with a steel and yellow gold bracelet inspired by the folding riveted bracelets of TUDOR watches produced in the 1950’s and 60’s. These were famous for having rivet heads for attaching the links, shown on the side of the bracelet as well as a stepped construction. These two aesthetic details are incorporated into the new model, integrating modern manufacturing methods using solid links. 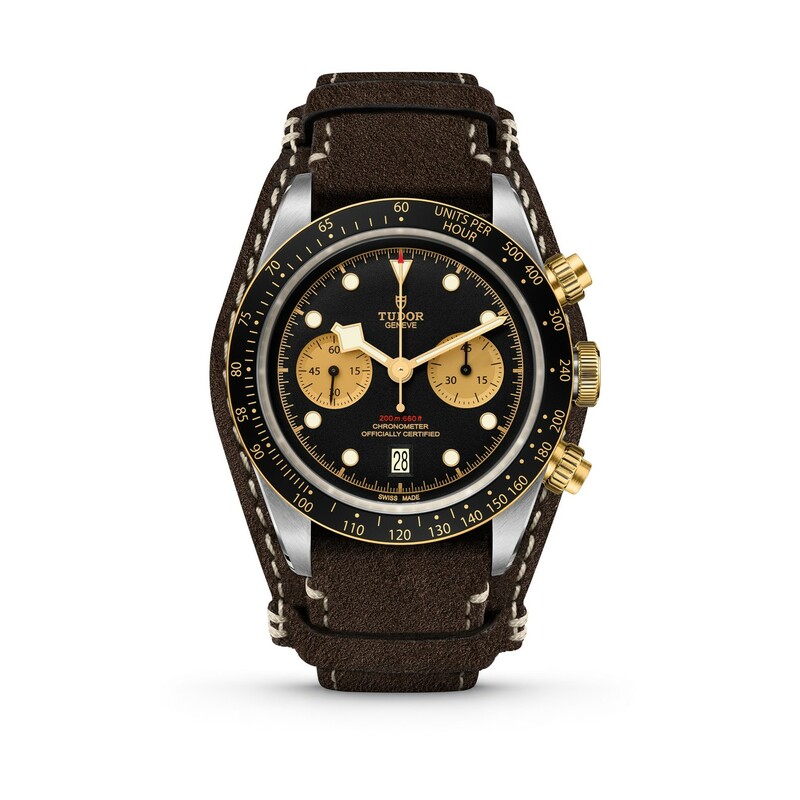 Finally, in a spirit of 1970’s racing, the Black Bay Chrono offers a bund type option in brown aged leather with ecru stitching and a folding clasp.